This is for 07-08 maxima only. 1) Connect the Black wire of the ASWC to ground. You may use the same grounding point as the aftermarket radio. 2) Connect the Red wire of the ASWC to a 12 volt accessory wire, one that turns on and off with the ignition key. 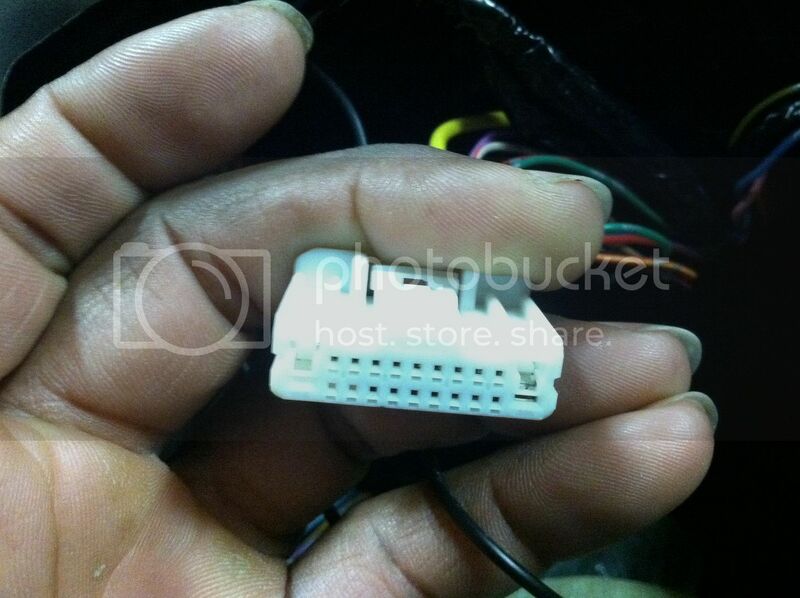 4) Connect the White/Green wire of the to pin 16 of the vehicle. 5) Connect pin 15 of the vehicles harness to Ground. 6) All other wires on the ASWC please tape up, they will not be used. If you are using an Eclipse or Kenwood radio, plug the female 3.5mm connector with the Brown and Brown/White wires into the male 3.5mm connector of the ASWC harness. * For Kenwood radios or JVC’s with the Blue yellow wire: Connect the Kenwood/JVC SWC wire (normally Blue/Yellow) to the Brown wire of the ASWC. Isolate and tape the Brown/White wire, it will not be used. * For Eclipse radios: Connect the Eclipse SWC wires (Normally Brown and Brown/Black) to the Brown and Brown/White wires of the ASWC. Brown goes to Brown and Brown/White goes to Brown/Black. For all other radios, plug in the male 3.5mm connector of the ASWC into the back of the aftermarket radio, designated for an external SWC control interface. Please refer to the aftermarket radios manual if you are in doubt where the 3.5mm connector of the ASWC goes. Once all connections have been made, plug in the aftermarket radio if not done already. 1) Turn the ignition on; the led will start flashing rapidly which means the ASWC is looking for the vehicle and the radio. Go to step 3. 3) Push and hold the Volume Up button. 4) After a couple of seconds the led should stop flashing and not light up for 2 seconds. At this point do not push any buttons. 5) After the 2 seconds there will be a series of 7 flashes, some short and some long. 6) The led will pause for another 2 seconds then flash up to 9 times. 7) This is the end of the auto detection stage. If the ASWC detected the vehicle and the radio successfully the led will light up solid red. 8) Make sure the steering wheel control buttons function correctly in the vehicle and enjoy your radio. So what if the led does not light up solid red or the steering wheel controls do not function properly? Check out troubleshooting section below. 1) Verify that you have 12 volt accessory and a good ground to the ASWC. 2) Verify with the vehicle information sheet on the Axxess website that you connected the correct steering wheel control wire(s) in the vehicle to the correct wire(s) on the ASWC. 3) Verify that the 3.5mm connector is connected to your radio securely and in the correct location. 4) If using the female 3.5mm connector on an Eclipse or Kenwood radio, verify that the radio’s SWC wire is connected to the correct wire on the ASWC. The 1st series of led flashes represent the wire(s) that are connected to the vehicle from the ASWC. If during the auto detect sequence there was no long led flash, just short ones, the ASWC was not connected to the correct wire in the vehicle or the incorrect wire was used on the ASWC. Double check connections and the vehicle information sheet to verify that you have the correct wires connected. The 2nd set of led flashes represents what brand radio the ASWC believes it is connected to. Each flash is for a different radio manufacturer. For example if you are installing a JVC radio the ASWC should blink 5 times. * Note: If the ASWC flashes 7 times and you do not have an Alpine radio connected to it that means that the ASWC did not see any radio connected. Verify the 3.5mm connector is connected to the SWC input on the radio. Last edited by deep007; 11-17-2011 at 02:28 AM. You get a sticky, my friend! Good job!!! Yes. Make sure it is a good ground. The big metal pipe in there, i thought was a good place to ground everything. After a few winters of my steering wheel controls working intermittently when i use the defroster i have come to realize that it may not have been as an idea place as i previously thought. The reason it is not such a good ground is that the temperature changes dramatically from when the steering wheel interface was programmed. The heat flowing through the pipe to the defrost ducts makes the resistance of the grounding properties increase as it gets hotter. Causes the steering wheel interface to send the wrong voltage to the radio for that particular function. It causes my steering wheel buttons to either not work or do the wrong function. One of these days i will go back in there and relocate the ground and bypass the video lockout but i haven't gotten too irritated by using the controls on the radio from time to time. You did not get your scotch lock seated on there correctly. Probably using one that is just small enough to pierce the jacket on the wire but not make a secure connection to the wire inside(blue one). The red ones work much better than the blue one's with the size the wiring that is used in the max. That is weird. I did not examine that closely if the aftermarket harness even had anything connect to that particular wire. It shouldn't have since it does not have any purpose to go directly to the aftermarket radio. It shouldn't even have a wire on aftermarket harness side. 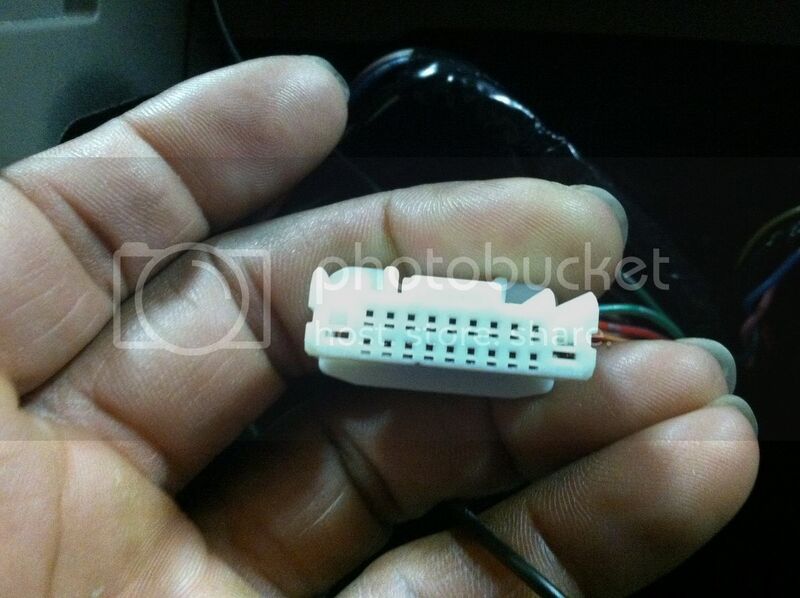 Something could have been shorted on either the factory connector or the aftermarket harness connectors where they plugged into one another. I have seen worse issues with aftermarket connectors. Like the ground and power going through the speaker connections on the aftermarket harness. I always verify before i connect anything and caught it on the aftermarket radio harness i used on a neon. Found it while probing what i thought were the power lines. The speaker lines grounded out and sparked. ok for the 07-08 maximas when is says vehicle harness what are they refering to? I going to solder the wires in the morning. Before I start cutting wires, I want to verify this is the correct plug. Where was that plug located?